Received 19 January 2010; revised 24 March 2010; accepted 26 March 2010.
and they also answered a detailed questionnaire. 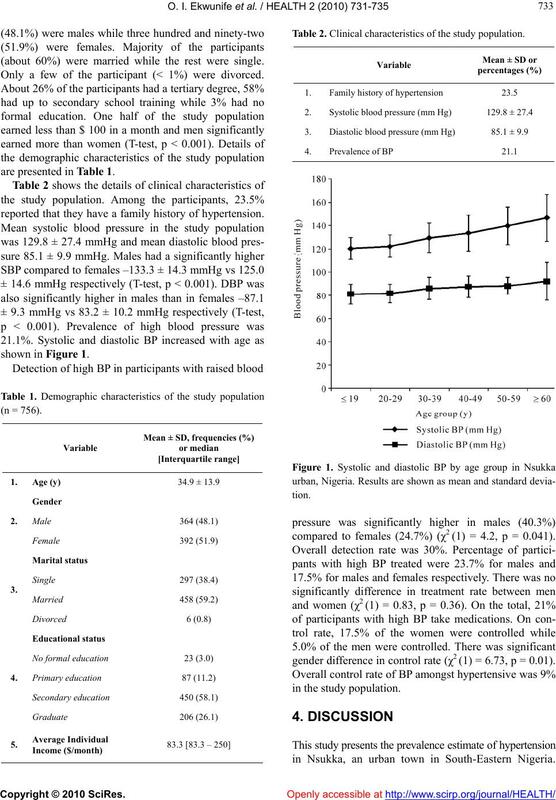 prevalence of high BP compared to women. parable with other studies in Nigeria and Africa. heart failure, stroke, and kidney diseases . useful in efforts to control hypertension and other NCDs. lowed by systematic sampling of the next three houses. the exercise after covering the selected clusters. among the population defined as having hypertension. tailed significance level of 0.05 was used. (about 60%) were married while the rest were single. Only a few of the participant (< 1%) were divorced. reported that they have a family history of hypertension. compared to females (24.7%) (χ2 (1) = 4.2, p = 0.041). gender difference in control rate (χ2 (1) = 6.73, p = 0.01). Table 3. Blood pressure by age group and gender. 21% were detected, while 9% were controlled. examined motor bike riders in Benin City, Nigeria . adults could be classed as hypertensive . but only 6.2% had optimal blood pressure control . in both surveys were comparable . less than results obtained in developed countries . the randomness of the sampling. on non-communicable diseases in the African sub-region. nal of Medicine and Medical Sciences, 32(4), 395-399.
in Blacks. 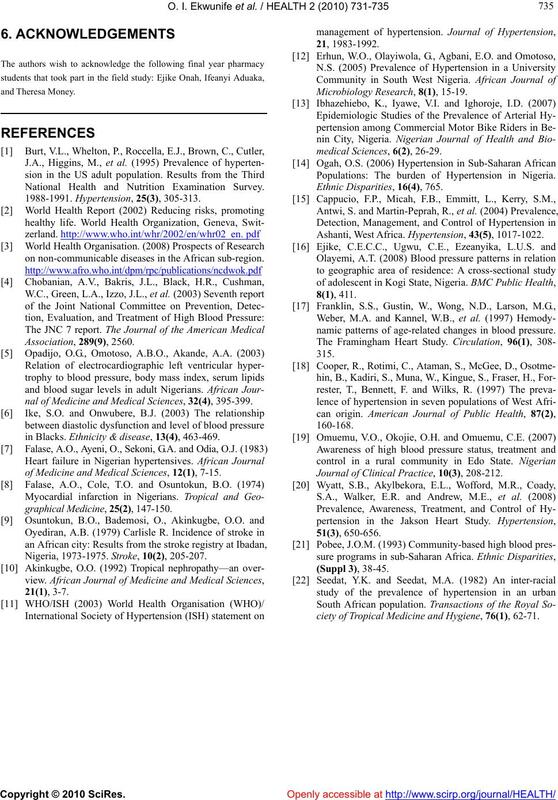 Ethnicity & disease, 13(4), 463-469.
of Medicine and Medical Sciences, 12(1), 7-15. Nigeria, 1973-1975. St ro k e , 10(2), 205-207. 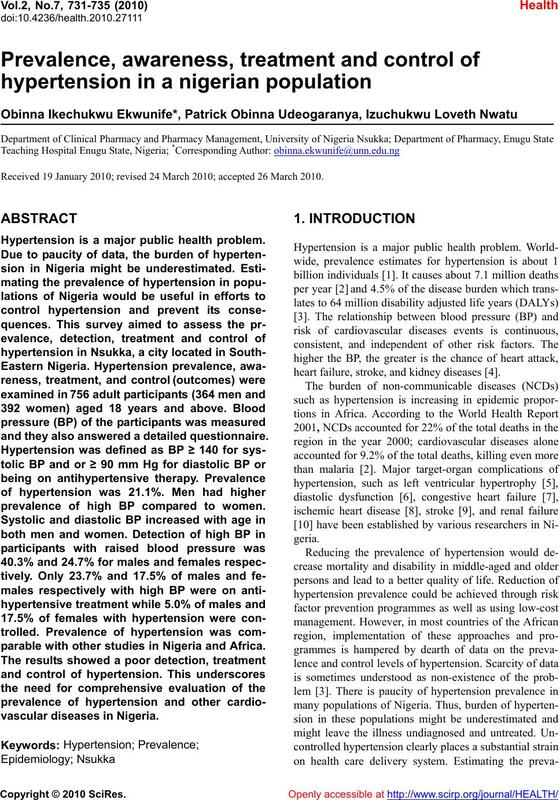 Populations: The burden of Hypertension in Nigeria. Ashanti, West Africa. 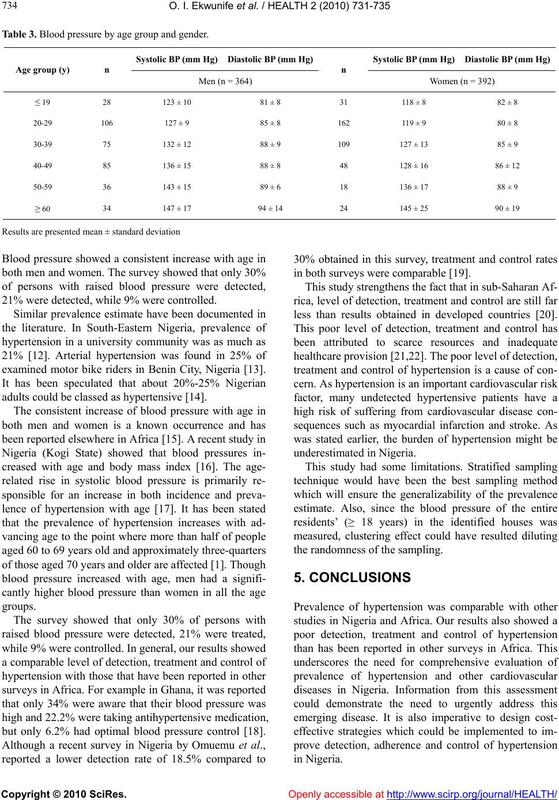 Hypertension, 43(5), 1017-1022.
namic patterns of age-related changes in blood pressure. 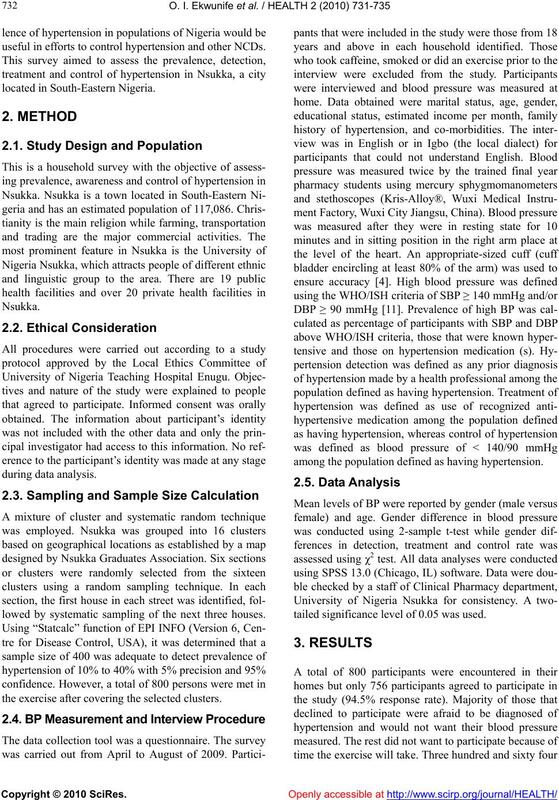 Journal of Clinical Practice, 10(3), 208-212.
ciety of Tropical Medicine and Hygiene, 76(1), 62-71.